Liesl sent me this dress from Mint, sold on the Intermix site (click the image to go there). I love the base fabric (cotton lawn with a neat print) but I'm not sold on the navy silk border OR the back zipper. This kind of dress should have a side zipper. A back zipper just ruins the line. The navy silk … I don't like the pairing of silk charmeuse with cotton lawn, and I don't like navy. I think this would have been much better with orange gingham border. 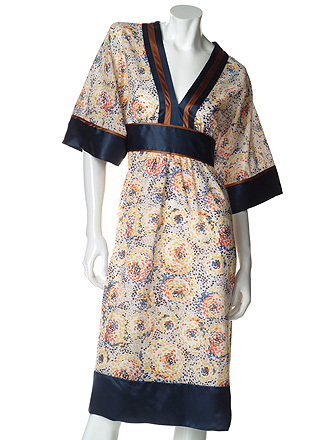 The whole point of the Duro-style dress is to mix prints! Playing it safe with a solid border is just boring. To add insult to injury, it's $415 (!!!) and comes in three sizes. Yep, 2, 4, and 6. Sure do cover a lot of American women when you carry that wide of a size range! Sheesh. In short: Mint, thanks for playing! We have some lovely parting gifts for you at the door. Just click on this, okay? Is that print Starry Starry Night? They should have found a nice cotton lawn with an allover ear print to use instead of the navy. I’m not wild about orange gingham unless you’re Dorothy from the Wizard of Oz on drugs. A silk loud orange camouflage print would be snazzy though. I actually really like this one. The print immediately reminds me of Seurat; and although I’ve always liked navy, I’ve never looked very good in it. But the older I get the better it seems to suit me (“thanks” to my prematurely-greying hair!). I’m guessing that you’d have to dry-clean this one to keep the two fabrics from srinking/stretching to different degrees and ruining the flow of the dress. (And I’m vehemently anti-dry-cleaning-required-clothing.) But hey, if I were rich or if it were a gift, I’d wear it at least once a week all summer long! la belladonna! Thank you for my first good laugh of the day!I really like the looks of this dress, but I don’t like the mix of fabrics. I think even with dry cleaning there’d be problems with the contrasting materials. I’d like it better all silk — not that I’m spending $415 bucks on it. Two years later and this is still a great dress. I would never mix such different weight materials on a dress, but the colors work.